Seattle’s largest commercial espresso service provider, Visions Espresso Service stands strong after thirty years in business. Our service department experts and 24/7 on-call field technicians offer one of the fastest average service response times in the industry. Trained and dedicated technicians focus on answering questions and providing quality service to the Seattle Metropolitan area and the state of Washington. Here is a list of brands we service: Anfim, Astoria, Bunn, Concordia, Ditting, Egro, Everpure, Eversys, Faema, Fetco, Franke, La Cimbali, La Marzocco, La San Marco, La Spaziale, Mahlkonig, Marco, Mavam, Mavea, Mazzer, Modbar, Nuova Simonelli, Pasquini, Rancilio, Schaerer, Slayer, Synesso, Unic, Victoria Arduino, Wilbur Curtis and WMF. This list is not inclusive of all brands, and we do not work on all models or years of the brands listed. Visions also offers worldwide over-the-phone assistance and our service technicians are always happy to answer questions regarding home and commercial equipment issues. Feel free to visit our service department yourself by bringing your equipment in for an assessment or for preventative care maintenance. Refurbished espresso equipment is always in high demand; thanks to our very own Fit & Finish Workshop there is always equipment available for sale. Equipment trade is available on a conditional basis and value may be put forth towards the purchase of a new machine. Refurbished equipment is generally listed at an excellent discount compared to purchasing new, as well warranty coverage is available for most equipment. We also offer quarterly and annual service agreements to keep your business up and running. See our current refurbished equipment offering here. 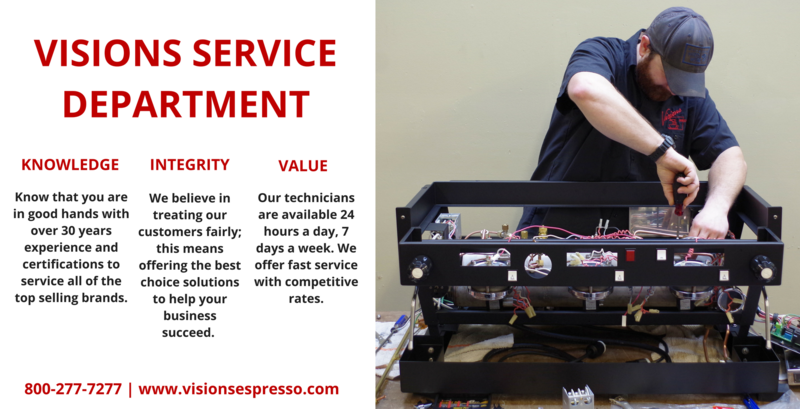 Give us a call at (206) 623-6709 or email service@visionsespresso.com with inquiries. If you have any specific questions for our Tech Department, you can contact them by filling out the form below.